Jeff Pollard, co-owner/operator of Best One Tire at 120 N. Stolle Ave. in Sidney, shares information on some of the tires he sells with State Supreme Court Justice Judith L. French who visited his business to learn more about the needs of business owners in Ohio. She visited Sidney Monday afternoon, April 1. Jeff Pollard, left, and His wife and co-owner Heather, right, share information about their business, Best One Tire at 120 N. Stolle Ave. in Sidney with Ohio State Supreme Court Justice Judith L. French, center, during a tour of their facility Monday afternoon, April 1. SIDNEY — Ohio Supreme Court Justice Judith L. French traveled from Columbus to Shelby County Monday, April 1, where she met with Jeff and Heather Pollard, owners of Best One Tire, 120 N. Stolle Ave., for a tour of their facility. French visits businesses throughout Ohio to stay in touch with her constituents concerning the controversial issues which may come up in court hearings. This helps her to make decisions that are fair and based on first-hand information rather than relying on hearsay or data that may be biased in one way or another. Her goal is to ensure access to justice for all Ohioans. She also speaks to students from all around Ohio sometimes in a classroom setting and other times at the Thomas J. Moyer Ohio Judicial Center in Columbus, Ohio. After a lengthy legal career that began in 1988 including a 12-year stint as a judge in the Ohio Tenth District Court of Appeals, French was appointed to the Ohio Supreme Court by former Ohio Gov. John Kasich due to Justice Evelyn Stratton’s retirement at the end of 2012. French assumed that office in January 2013 and served out Stratton’s unexpired term. She was re-elected to the post in the Ohio general election in 2014. Since her appointment French has made it a habit to visit businesses, large and small alike, in all of Ohio’s 88 counties every year; a task that keeps her on her toes but she truly likes her work. “I really enjoy meeting people and seeing their business operations first-hand, I’m out on the road several days of every week doing so. Along with learning more about the intricacies of their particular situations through personal conversation, I am provided with a wealth of behind-the-scenes information by seeing what’s involved with their business operations directly, what’s really taking place, and what it takes to survive in an ever-growing and changing marketplace,” said French. “In turn I can make sound decisions that may concern them in the future and do so with fairness and confidence. I also share that information with students all across the state to encourage them in respect to their future in education and potential opportunities in the job market. I represent the whole state, my office is non-partisan and getting out there with the people keeps me informed about the reality of life and the challenges business owners are faced with on a day-to-day basis.” French said. French was invited to Best One Tire by the Pollards and Alex Boehnke, manager of Public Affairs with the Ohio Council of Retail Merchants. Boehnke hoped the meeting would shed some light on the role a business like Best One Tires plays in the local community and the effect their business has on the local economy and job market. Best One is a member of the merchant’s organization and was chosen because of their positive impact in local business and Jeff Pollard’s connection with local education. He is an active member of the Upper Valley Career Center’s Board of directors and works closely with the learning center to provide business input and job opportunities for students enrolled there. The Pollards employ about 25 people at their two locations. Currently 10 employees work at Best One Tires at 120 N. Stolle Ave., and about 15 people at Sidney Tire, 1231 Wapakoneta Ave. The Pollards bought Sidney Tire in 1978 and built the Best One location in 2004. Jeff Pollard pointed out both stores are very busy and they provide a large variety of services. “While Sidney Tire caters mainly to tire related services at the garage on Wapakoneta Avenue, they are also out on the road and on the farm fixing and replacing tires in situations where it is impossible to bring the vehicles, semi-trucks, or farm machinery to us. 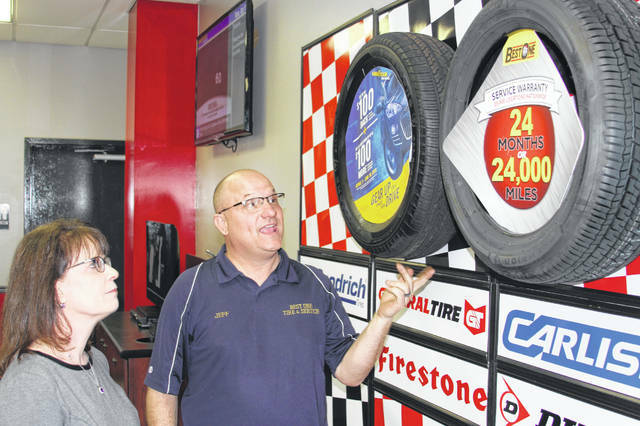 Like Sidney Tire, Best One Tire not only does tire replacement, alignment, brakes, etc., but also does engine tune-ups and other more involved repairs up to and including engine replacement,” Pollard said. The Pollards welcomed visitors during the event and about a dozen people including a couple of local business owners attended. Those in in attendance were given a tour of the facility and enlightened about the history of the Pollards family tire business which was started by Jeff’s father many years ago. “Dad started with one store and it later became apparent that his four sons were never going to see eye-to eye on how the family business should be operated so Dad expanded the business until each son had their own store. Time passed and now only two of the sons are still in the tire business, myself with the two stores in Sidney, and my brother who owns and operates Madison County Tire in London, Ohio. The Pollards expressed their gratitude about being chosen for the event and a visit from French. “We really appreciate Justice French taking time out from her busy schedule to come see us and witness all that goes on in a day in the tire business. It’s nice to know we have competent public officials dedicated to serving their constituents. As business owners the challenges we face are growing in number and scope, it’s good to know our Supreme Court Justice is in touch with the realities of life in the business world especially here in Shelby County. Sidney is a great place to live and work and we appreciate all of our loyal customers and their confidence in us to provide them with the best service possible,” Pollard said. “Hopefully this visit will remind folks living in and around our community that the folks in Columbus are concerned about us, our future, and the level of service they provide as well,” he said.